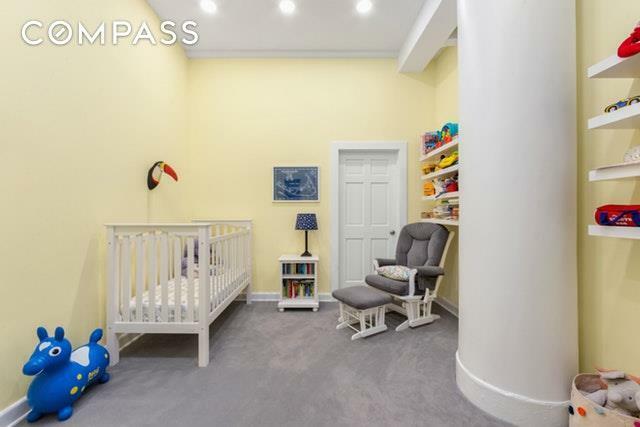 Make your home in this lovely updated Greenwich Village/NoHo prewar one-bedroom, two and a half bathroom, plus generous bonus room or home office (previously used as a nursery). 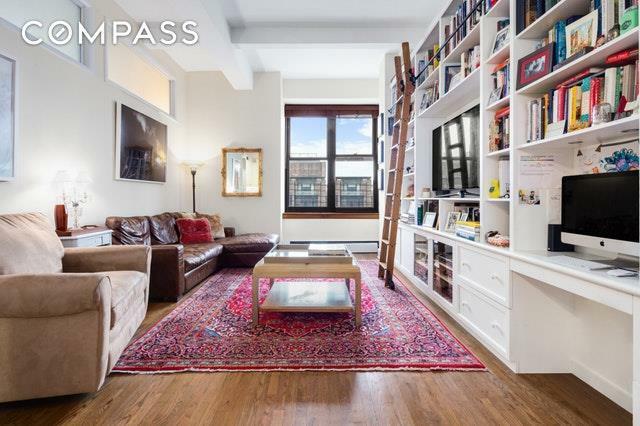 This quintessential downtown loft offers and abundance of storage, numerous upgrades, 11 foot ceilings and washer dryer. The chic chef's kitchen a modern take on French Country design sets the tone for this stylish Greenwich Village loft. Ample custom cabinetry, granite countertops and a distinctive mirror-tile backsplash surround top-of-the-line stainless steel and integrated appliances, and the large island/breakfast bar, complete with wine cooler, provides space for casual dining and conversation.In the sunny living room, you'll find soaring beamed ceilings supported by a substantial, yet non-invasive column, hardwood floors, and a massive wall of built-ins accessed by a library ladder. Clerestory windows allow light to flow from the adjacent master bedroom, where you'll find a wide western exposure and large walk-in closet. There's a well-appointed marble full bathroom here, and two half-bathrooms essentially creating another full bathroom plus laundry room flank the entrance to the expansive bonus room with its sizable walk-in closet and separate entrance.This convenient and comfortable retreat is located within the NoHo Historic District, 250 Mercer Street is an 1885 Neo-Greco building constructed in brick and cast iron. Residents enjoy brand-new elevators, renovated hallways and lobby. 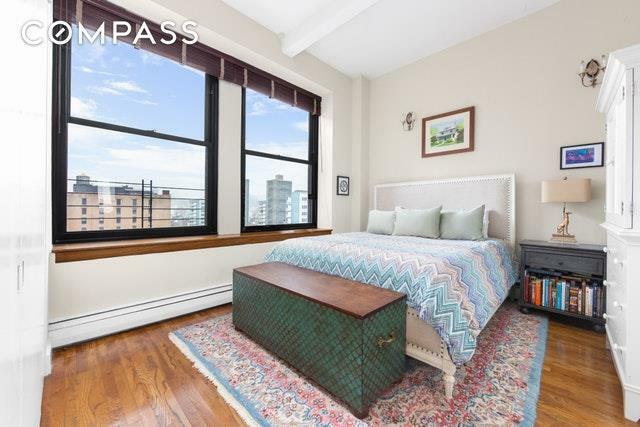 Amenities include full-time doorman service, live-in superintendent, furnished courtyard and roof deck, bike storage and laundry. 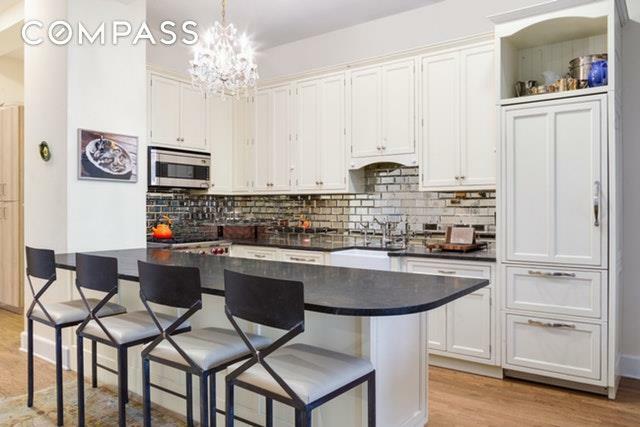 Generous policies permit pets, pieds--terre, co-purchasing and guarantors.This home is at the epicenter of Greenwich Village living with easy access to SoHo and NoHo. Enjoy direct proximity to fantastic dining, shopping and nightlife. Washington Square Park, Mercer Playground and a dog run provide open space just outside your door, and NYU institutions, including the Skirball Center for the Performing Arts. Transportation options include B/D/F/M, N/R/W, 6 and A/C/E trains. Listing courtesy of Kelly Robinson of Compass.